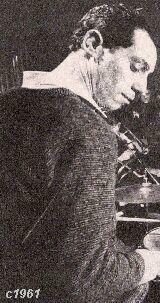 Regarded as one of founding fathers of modern jazz in the UK, Laurie Morgan was born in Stoke Newington, North London in 1926 and began playing drums at the age of ten. In 1940 he started work as a tea-boy in the De Havilland aircraft factory but was released from war work a year later to perform in variety in the Rhythm Racketeers, a quartet that included Don Rendell, (then the owner of a beaten up saxophone that was held together with rubber bands according to Morgan). In 1943 and 1944 he worked with Hetty Booth doing USO tours of American bases and in 1946 was "sitting in" at the Fullado Club in New Compton Street, Soho, which was a bar frequented by US servicemen. This was where he jammed with Ronnie Scott, Tony Crombie, Don Rendell and others. While playing at Churchill's Club in 1947 he formed the idea, with Ronnie Scott, and Pete Chilver of visiting New York with Scott and others to hear the new bebop at first hand. From that moment he was hopelessly hooked on bebop and returned to the UK with boxes of records determined to spread the bebop sound wherever possible. 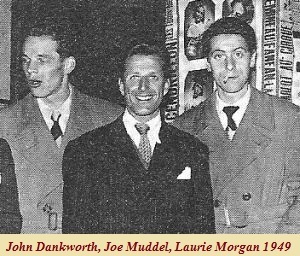 In 1948 he became a founder member of Club Eleven and played in the Johnny Dankworth Quartet with Bernie Fenton and Joe Muddel. He worked in Leon Roy's big band in 1949 and in 1950 formed his own group Elevated Music and visited France and Belgium with the group. Varied dance band work followed from 1952 including Ambrose and Harry Hayes, but in 1954 he returned to jazz with the Dizzy Reece Sextet. Also busy freelancing throughout the 1950s. Formed his own Contemporary Jazz Unit in 1959 and played with Tommy Whittle in the early 1960s. Then worked in theatre and became long time resident percussionist and assistant musical director at the National Theatre. At the time of writing, (late 2008), he continues to lead a group that includes bass player Coleridge Goode, pianist Denny Turmer and a guitarist for Sunday lunchtime gigs at the Kings Head, Crouch End. The music played is bebop. Like many of our bebop pioneers his recorded legacy is small. Fortunately it is all available on CD. Bremavin*^/Lover Man*=/Second Eleven*#+/Body and Soul*#/Night in Tunisia*^. Bobby Wellins (ts), Stan Tracey (p), Jeff Clyne (b), Laurie Morgan (d). Love With Variations*/McTaggart*/Culloden Moor*/Afro Charlie*. Let Them Crevulate*/Everywhere Derriere (unissued)/Amoroso Only More So (unissued). This page was last updated during October, 2014.